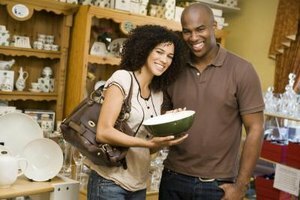 Create an anniversary gift for each other at a pottery shop. 4 What Should I Get My Boyfriend for Our 6-Month Anniversary? Though many people wait until their first year together to celebrate their relationship, you and your boyfriend have made it to the six-month mark and you want to do something special. Planning an indoor activity will offer a romantic way to honor the short time you have been a couple. You will reflect on what you did on your six-month anniversary as your relationship continues to grow. Redo everything you did on your first date -- but in your home. Wear the same first date outfits. Prepare the meal you ate together or order the same cuisine from a delivery service. If you saw a movie on your first date, snuggle up and rent the same movie again. Create a playlist of the tunes you danced to and share a few dances together. Bring out any keepsakes from the first date, such as the teddy bear he gave you. Get in touch with your creative side. Head to a pottery shop. Both of you will select a ceramic to paint with the other in mind. For example, paint a decorative mug if he enjoys his morning coffee. Let him paint a ceramic puppy to sit on your desk if you adore animals. You can paint the item in the favorite color of the other person and even paint designs on it. You will have to wait a few days until the items are fired and glazed. Enjoy the finished ceramics as keepsakes. Go to karaoke night at a local restaurant or bar for an evening of humorous singing to celebrate your special day. Select romantic songs that remind you of each other and hit the stage. You will have an embarrassing yet funny time belting out tunes and attempting to sound good to the audience. Add dance moves to the mix to tickle your funny bones. After you are done, eat dinner and laugh as you watch other tone-deaf couples perform. Create the romantic ambiance of a park inside your living room. Move furniture to the side and lay a large blanket on the floor. Play a nature sounds CD. Surprise each other by asking your boyfriend to prepare a meal for you, while you prepare a meal for him. Think heart-shaped sandwiches or pizza. Pour glasses of champagne for a toast. Think of ways to express your feelings that will celebrate the six-month mark. For example, write down six things you adore about each other.